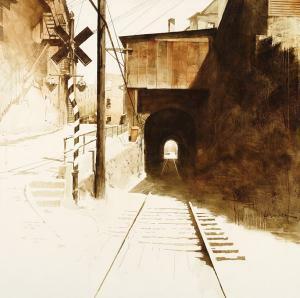 Raised in Weathersfield, Vermont and now residing in Bellows Falls, Charlie graduated from Exeter Academy in New Hampshire and then Yale University, where he studied painting under Richard Lytle, William Bailey and Bob Reed. After college he lived and worked in Ludlow, Vermont, painting signs and working with his brother, who published The Black River Tribune. Hunter then moved to Northampton, Ma. and worked as a graphic designer for a company that specialized in creating concert posters for colleges and music venues. This led to creating artwork and design for the Iron Horse Music Hall in Northampton, which created contacts with musicians that allowed him to produce album cover art for various indie artists. These music connections ultimately led to Charlie co-launching a music management firm under the name Young-Hunter Music Management. His clients included Dar Williams, Chris Smither, Grammy Award-nominee Greg Brown, and Grammy Award-winner Shawn Colvin. 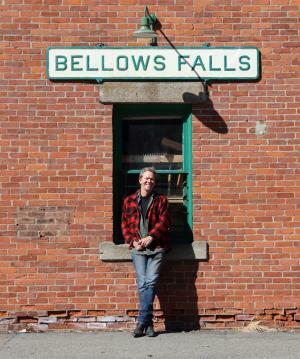 In the late 90s Hunter wanted to get back to his art and returned to Vermont and settled in Bellows Falls, looking to help revitalize what was being described as the "creative economy in the old Vermont mill town." In 1999 Charlie started promoting local concerts and launched Flying Under Radar, setting up shows at the then-vacant Corner Pharmacy space on The Square, Oona's Restaurant and the Hotel Windham, all located in Bellows Falls. In the summer of 1999, Hunter then launched the Roots on The River festival series which occurred through happenstance when he set up a show in Bellows Falls for Canadian singer/songwriter Fred Eaglesmith that drew a great response, with fans coming to the show from as far away as Syracuse, New York. The following year Charlie promoted two more shows for Eaglesmith, including one at the old Rockingham Meeting House which has no electricity, a very unique show for all the "Fredheads." From there it developed into an annual event and over the next decade, grew into a multiple-day and artist festival that brought musicians and fans from all over the country, becoming very successful before he turned the event over to another local music fan (and attorney), Ray Massucco. However, Charlie had other ideas, launching his Roots on the Rails adventure in 2001 in which his folk music artist-friends, who knew Charlie had a deep appreciation for trains, encouraged him to organize a trip across Canada to Vancouver where the annual Folk Alliance event is held. The train event has continued to grow and is now described as "North America's moving music adventure. World class live music on board long-distance trains." Nowadays Charlie mostly concentrates on his painting, and his newest endeavor is the recent release of the aforementioned art instructional DVD titled Rule-Breaking Landscaping. So, how did this new art project come about? 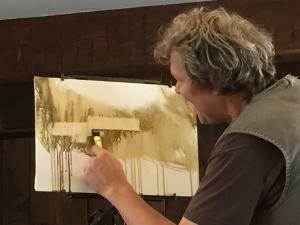 Because a few video clips featuring Charlie painting had made their way to YouTube and garnered some attention, the idea to create an instructional DVD had been on his mind. Ironically enough, he was also approached by Eric Rhoads, publisher of Plein Air and Fine Art Connoisseur magazines about producing a DVD. “Eric and his editor had, more or less, brought me to a national audience back in 2012 through an event they were hosting each summer in the Adirondack Mountains, as well as writing an article about me in Plein Air, Hunter said. Hunter is certainly comfortable doing a demo in front of an audience, for it is a part of the working-painter’s life. It’s a performance to a large degree, and Hunter spent enough time in the music business to know what works and what doesn’t onstage. “But doing it in front of the implacable eye of the camera, without getting a reaction from an audience – because there isn’t one – only the director and cameraman, all of whom are busy doing their jobs. It was fun, but quite challenging, for sure. Of course, I hope folks will buy the video, and while it is literally two hours of watching pant dry, we do emerge on the other side with an actual completed painting!" From there, Charlie will fly to Atlanta to teach a workshop, then drive to Apalachicola, Florida to participate in a plein air event with 25 other painters to document the terrible destruction that hit that region during the hurricanes last year. 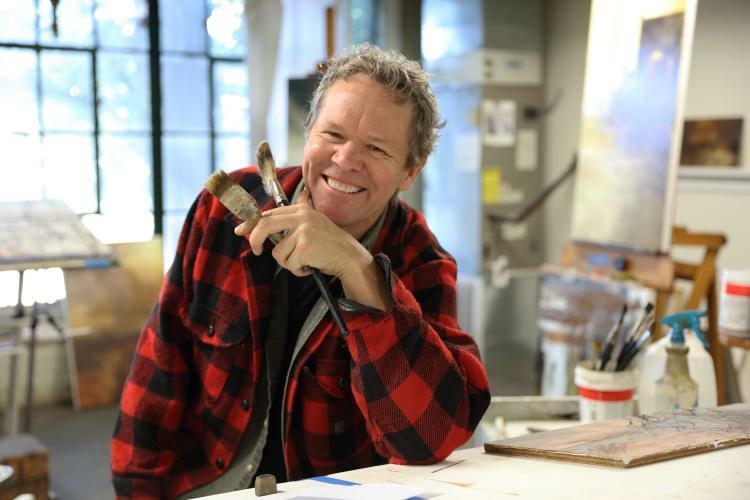 Then in May, Charlie will lead a local workshop for Village Arts of Putney, before participating in plein air events in Maryland, Wisconsin, and Texas. 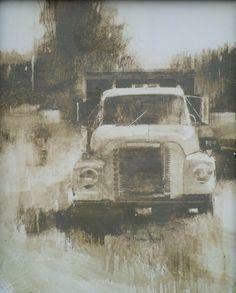 Then, he will open a gallery showing locally at Grafton’s North Star Gallery in late September. Yes, the renaissance man is busy! To learn more, visit www.hunter-studio.com.